A new Assassin's Creed that is not Assassin's Creed 3 is coming to stores in the Fall, but nobody knows just what is is yet. A piece of boxart that made its way to GameStop today has landed in The Escapist's lap and apparently reveals a new Assassin's Creed game in development. It's called Assassin's Creed: Brotherhood and is scheduled for Fall 2010. The game hasn't been officially announced, but it was confirmed to multiple outlets (such as Joystiq) that it is real and more information is coming next week. Assassin's Creed: Brotherhood will include some type of new multiplayer component, as a caption below a screenshot reads: "A never-before seen online multiplayer experience." Live and breathe as Ezio, now a legendary master assassin, in his struggle against the Templar Order. Lead your own brotherhood of assassins and strike at the heart of the enemy. Rome. And for the first time, take part in an innovative multiplayer layer allowing you to embody an assassin of your choosing and define their killing style. Ezio is shown in front of six assassins all dressed uniquely, seemingly of different abilities and classes. Anything said about Brotherhood now is pure speculation, but the multiplayer component where a player can perhaps control such a unique assassin sounds interesting. Judging by the simple title, it's unsure if Brotherhood will be a digital and retail release, a spinoff, fully priced or bargain priced, or what. What I do know is that players will probably complain less about an online game being required to be on the internet for DRM purposes. 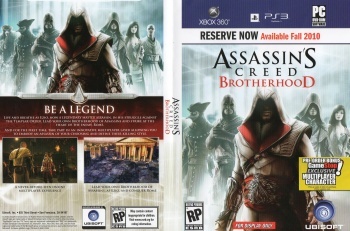 Pre-ordering from GameStop will net players an extra multiplayer character, and the boxart also shows that Assassin's Creed: Brotherhood will be coming to the Xbox 360, PlayStation 3, and PC. Whatever Brotherhood is, I'm thinking someone at GameStop is getting tortured with a pitchfork right now.